For decades, girls' and boys' Levi's have been one of the most popular brands of jeans that is always spotted in both the classroom and the playground. When it comes to denim options for your child, Levi's offers several different styles of both jean bottoms and tops, guaranteed to give your boy or girl a versatile look that caters to practically any occasion. Whether your kid is typically the roughhousing type or likes to keep it clean and classy, there are both boys and girl's Levi's that will always cater to his or her look. 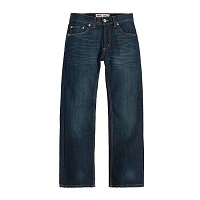 Levi's features five different styles for both boys' and girls' jeans that each have their own distinct design and fit. Make your kid a trendsetter by shopping for a pair of skinny jeans, a sophisticated look that rests just below the waist, clinging to the legs and ready to complement a fashionable top. The slim fit Levi's are slightly looser than the skinny jeans, yet still have that same modern appearance to add a boost of flair to your boy or girl's wardrobe. The straight Levi's offer the more classic, traditional look of a pair of jeans that's ready for whatever your kid throws at it. 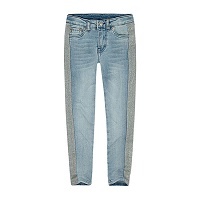 As for comfort, both the bootcut and relaxed Levi's are designed for a more loose-fitting experience that can also come in a variety of colors. You don't get to become a famous brand name like Levi's without having to reinvent yourself every now and then. There are several styles of kids' Levi's for both boys and girls that will be sure to accentuate whatever appearance they're are trying to go for. From the darker, edgier jeans that come in both faded or distressed designs to the lighter, more prominent cuts of jeans that range from flared to skinny, Levi's offers a wide range of jeans that can help your kid turn heads or blend in comfortably.